The first time I met this plant, was on a trip in the gorge of Messavlia. My first acquaintance with Smilax aspera was not pleasant : I scratched my arm on a thorny, climbing shrub with, at first sight, insignificant small flowers. I had collected some flowers and back in my atelier and after looking at it under the microscope I discovered that this plant has several interesting features. 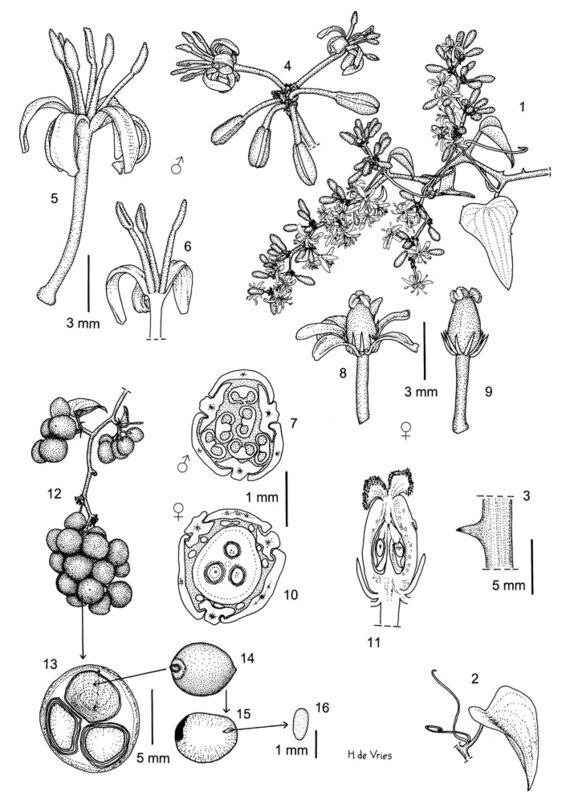 The first thing that drew my attention was one word in the Flora Europaea: “Dioecious”. A couple of days later I found quite a large bush of these thorny thickets just a few hundreds of meters from our house in Kalamaki. 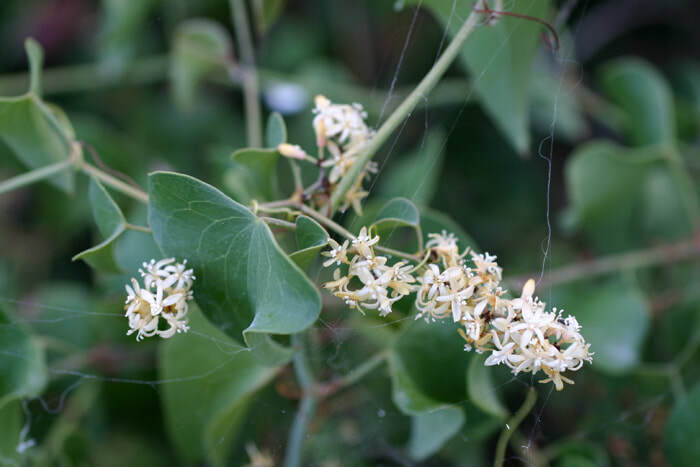 The Common Smilax (the common name; other names are Rough Bindweed and Prickly ivy, Mediterranean Smilax, Rough Smilax, Salsaparilla, Italian Sarsaparilla ) is a creeping or scrambling and vigorously climbing evergreen and tough shrub. It is a glabrous, dioecious perennial. This means that “the two sexes live in two different houses”, or in English: there are both male plants with anthers and female plants with an ovary. The stems can be up to 15 m, twining and climbing into and over other trees, with spiny zigzag branches. These stems are often angled and armed: they are quite prickly with vicious backwardly directed spines. The leathery, glossy and alternating leaves draw more attention than the flowers. Large leaves can be up to 15 X 9.5 cm but are mostly smaller. They are heart-shaped, very leathery and have a pair of tendrils arising from the base of the petiole, with prickles on petiole, margin and principal veins beneath. The blade has several strong longitudinal veins and reticulate fine venation, with pale green patches on the upper surface of most leaves. The size and shape of the leaves are very variable. Although it is regularly reported that the tendrils twine clockwise, my experience is that they entwine anything they touch, turning clockwise or anticlockwise, just what is nearest. 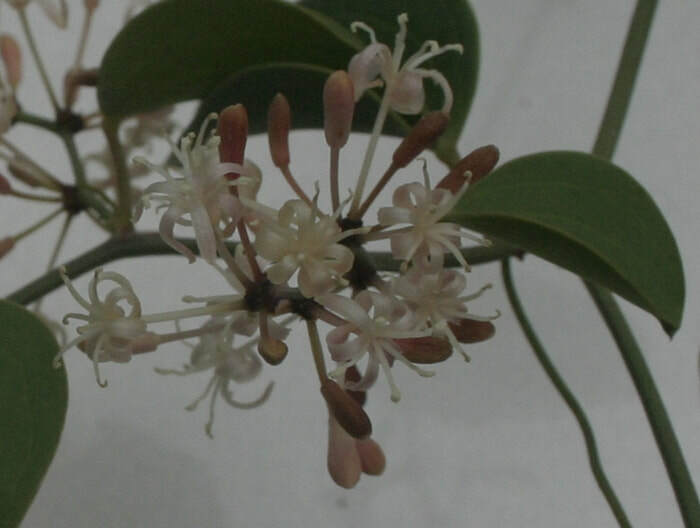 The flowers are borne in inflorescences that I would describe as “racemes of almost stalkless umbels” in the leaf axils and on terminal branches. These inflorescences are mostly identified as ‘fascicles or subsessile umbels on terminal and axillary axes’. Every umbel has a few typically monocot flowers that have a sweet almond smell. The axes can range from 3 to more than 30 cm, and carry 5 to 30 flowers with . minute bracteoles. The flowers are white but the perianth-segments are so narrow that the flowers are hardly noticed. 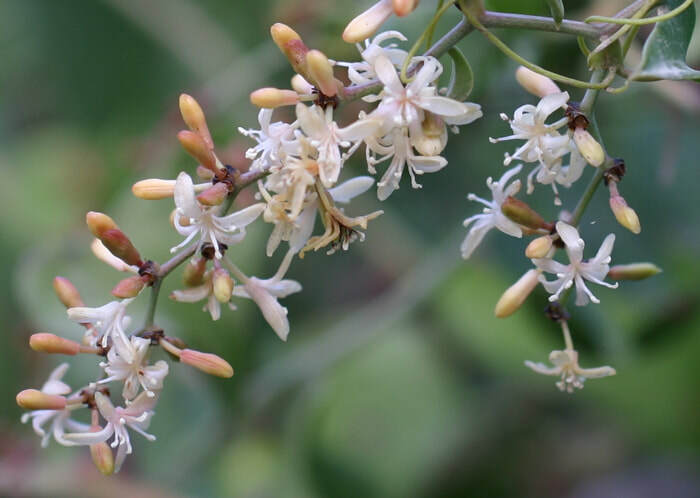 As I mentioned above, Smilax aspera is a dioecious perennial : it is unisexual, meaning that there are separate female and male plants with corresponding flowers, but never male AND female flowers on the same plant. But there is more !!! Please, come a little bit closer and have a careful look at the drawing. The male flowers measure about 1 cm across and consist of 6 perianth segments and 6 stamens. Sometimes the perianth-segments are described as the outer linear-oblong, the inner linear, but in practice in the mature flower the 3 petals and the 3 sepals are undistinguishable and are called tepals. However, in the bud-stage of the flower the 3 petals and the 3 sepals can be distinguished very well, see detail 4. If you take a look at details 7 and 10, you’ll see cross-sections of both a male bud and a female bud. The larger perianth-segments are the petals, and they are bended towards the inside at the sides of the lamina where they “hook” into the somewhat anchor-shaped smaller (in this stage : narrower) sepals. As you can see in detail 10, the ovary has 3 loculi, while detail 11 shows 1 ovule per loculus.There is no ovary, not even a tiny rudimentary as can be found in the also dioecious Urtica dioica L.(the large burning nettle) The 6 stamens stand in front of the 6 tepals and are called antipetalous. The female flowers are smaller, about 7 mm across. They consist of 6 perianth segments (again tepals) which are smaller than in the male flowers and a relative large superior ovoid-spherical ovary with a 3-delige stigma. Instead of 6 stamens the female flowers have 9 (10) staminodes, see detail 8 for a female flower and detail 9 for a female flower stripped from its tepals. I found 9 or 10 staminodes (mostly 9 of which one is double) in every plant that I collected in the gorge of Messavlia and in Kalamaki, Chania (literature gives 6 staminodes). The ovary is 3-locular with 1 ovule per loculus, the style is short, and the stigma is of the dry type. The fruit is a spherical rather soft berry, about 10 mm long and 7 mm broad. 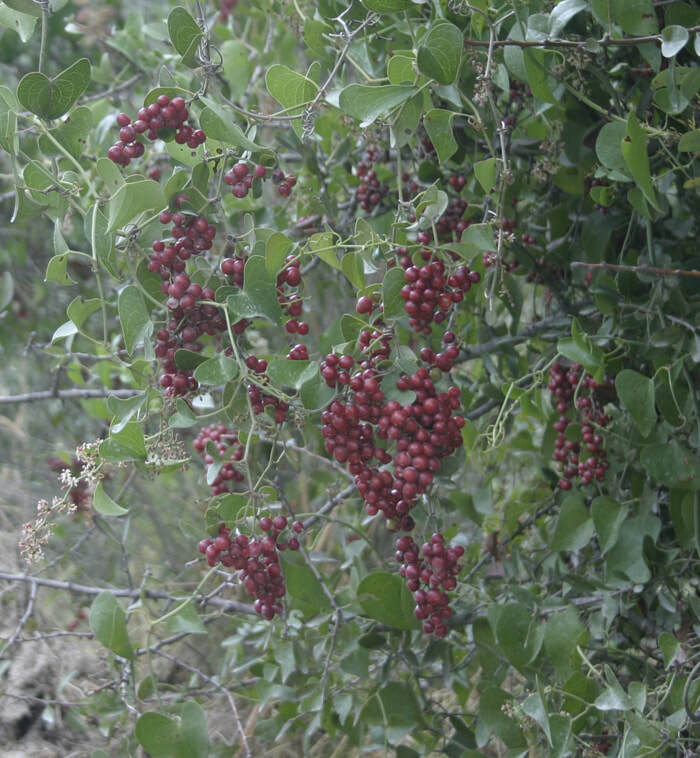 The mature berries are red, when they dry out they turn black. The maximum number of seeds is 3 (detail 13) but sometimes there are 1 or 2 seeds, the seeds are approximately 4 mm long and dark brown or black. The embryo is very small, about 1 mm (see detail 16). 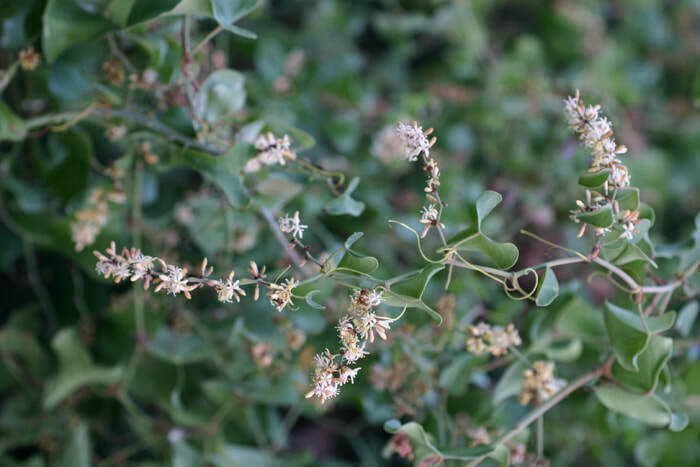 Habitat: it can be found growing in the garrigue (called phrygana in Crete), shrub and bushy places throughout the Mediterranean region, frequently forming an impenetrable hedgerow. Common Smilax is locally called a “killer tree” due to the fact that they can overshade the host tree and kill it. In the gorge of Messavlia I saw a small olive tree completely covered by Smilax, I had to search into the bush to find some olive leaves to understand that it really was an olive tree. Distribution: not only is it found in Crete and the East Aegean Islands and Greece but also in Albania, Algeria, Azores, Canary Islands, Corsica, Cyprus, France, Gibraltar, throughout India, Italy, Kashmir, Malta, Sri Lanka, Syria, Turkey, N. Africa and Ethiopia. The young shoots are eaten as a vegetable, raw or cooked, as an asparagus substitute. Smilax aspera is used to produce the Italian Sarsaparilla which has the same properties as the ones from tropical America, though to a lesser degree. It is often used as an adulterant to that plant. 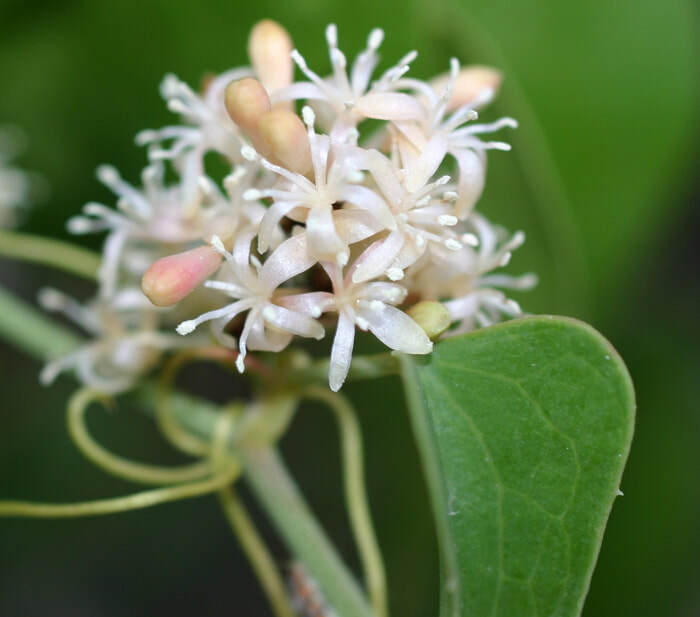 The Common Smilax is sometimes medically used to treat Psoriasis, bronchitis, enfisema, asthma and chronic rheumatism. The mature berries are squeezed and applied to the skin in the treatment of cutaneous disease. A red dye is obtained from the ripe tendrils. Name Derivation: Smilax comes from the Greek name for "poison". According to Dioscorides, it was considered an antidote to poison, and if the berries were crushed into a drink and given to a new-born child, ‘he shall be hurt by no poisonous medicine’. aspera comes from the Latin word for “rough”, possibly referring to the toughness of its branches, or to the presence of many small prickles that make the plant cling to clothes and other plants, giving it a rough sensation. There are different versions about Smilax in Greek mythology, but all involve a relationship between the beautiful nymph Smilax with a Spartan boy, Krokos, loved by the god Hermes. After the unhappy love affair Hermes (or Artemis?) metamorphosed him into the saffron crocus. Aphrodite transformed the tragic nymph into the Smilax, to grow nearby, so that they could be together for eternity. 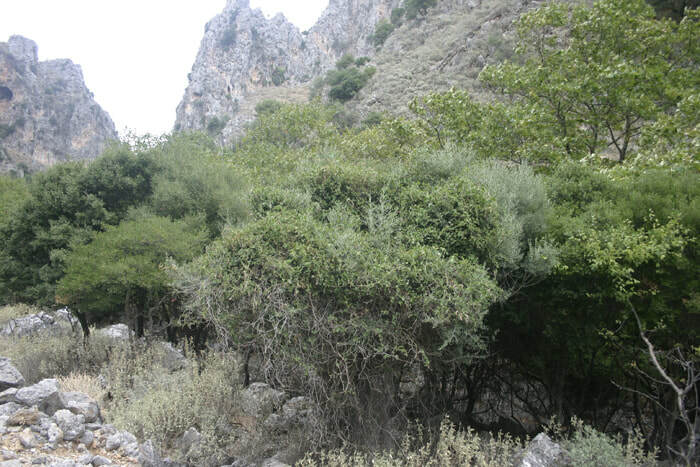 Picture above: in the gorge of Messavlia, the olive tree in the middle is nearly completely covered by a large Smilax.